A modern convenience in most homes constructed today are easy to clean backsplashes� that cover the portion of the walls between the counters and cabinets. Tile is the most common option, as it is very affordable for such a small area. 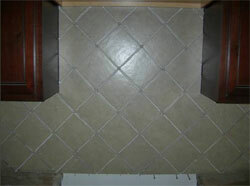 We opted to have our back-splash set in a diamond pattern, for a bit of a decorative element. The tiles are set just like the floor version with mortal placed on the walls and each tile set in place with a spacer in-between. The process takes about a day for the tiles to be cut and laid by professionals. Think about the many elegant ceramic backsplashes you can use on your kitchen walls. There are designs that can harmonize with a country-style look, art deco, or some other dominant architectural theme. Add color and perk up the spirits of people who use the kitchen everyday. An important thing to consider is that your cooking area backsplash tile should match your countertops. If your kitchen has the modern, industrial look, using a stainless steel backsplash may be recommended by your designer. While stainless steel is easy to clean (using some hot water, a little cleansing soap and sponge), it is more costly than ceramics or marble tiles, and installation is meticulous. A kitchen definitely need not be plain and boring, but if cost is what's stopping you from brightening up the area, there are actually affordable options to choose from. There are also other ways to enhance the look of your kitchen in an inexpensive, stylish manner. Using bead board paneling instead of a tile backsplash will enhance the look of the kitchen. There are many beautiful designs for kitchen backsplashes, but don't jump at the first one you see in a magazine or home improvement online gallery. Give your kitchen remodeling project careful thought (ponder on things, including details like what will look great as accent pieces, say, in a ceramic tile or natural stone backsplash) and unleash your creativity. Budget-conscious homeowners are bound to find that glass or natural stone tiles that create an awesome backsplash tend to be on the pricey side, but there are alternative low-cost kitchen backsplash ideas. Affordable options for a backsplash when undertaking your kitchen remodeling project are plain white porcelain subway tiles, vinyl tiles, or even broken china plates with a nice, colorful design. Using broken china plates may take time, but if you have time for a do-it-yourself project, using such materials to create a beautiful china mosaic backsplash can save you money. A backsplash is actually just a small area, so even if what you really want to use are new ceramic tiles, you can have these installed (or do it yourself) at minimal cost. Consider a design that will match not just your countertops but also your kitchen cabinets and shelves. A countertop with a contemporary style must be matched with a backsplash with sleek texture, while a rough backsplash will harmonize with a rough type of countertop. For those who want green elements in their homes, there are companies that specialize in glass tiles (that can go well with granite countertops) made from recycled materials. Indeed, kitchen walls are among the ideal spots to add a nice touch of design. Visit local kitchen design centers for ideas. You can also visit local tile stores that may have backsplash ideas set up for you to ponder. Whatever you decide, remember that your kitchen is usually a centerpiece for entertainment in your home, so a backsplash is a focal point for all visitors. A backsplash is also a fixture that you will probably have for a long time, so choose wisely and make sure you love your idea before you begin the project.